A Dutch guy with a healthy appetite looking to lose some weight. A Canadian lady battling addiction. And an angry Irish Man suffering from writer's block then finding it. Great premise, right? Intriguing, to say the least. 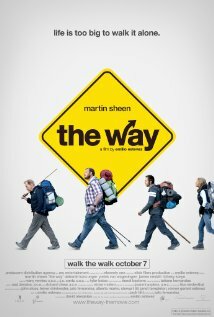 The movie introduced me to the "El camino de Santiago", a Christian pilgrimage that was popular in medieval times. There are several routes to travel but the most popular begins in St Jean Pied de Port on the French Side and ends 780 kilometers later in Santiago, Spain. 780 kilometers is about 485 miles. Historically people walked the entire way but biking has become a popular means of travel. The American is summoned to recover the body of his dead son who died along the El camino de Santiago and so begins his journey to complete the pilgrimage for his son. Along the way he meets the Dutch guy who needs to lose some weight, a Canadian lady battling addiction, and an angry Irish Man suffering from writer's block. They each find the completion of the journey to be the event that marks the beginning of a new life. And so ends the story of travelers on different journeys who become friends, inseparable. They started on separate paths that consequently led them to purge themselves and unburden their souls from things that weighed them down....TOGETHER. We all travel along that road, making friends, and making peace with guilt and the burden of guilt. This makes the movie so relevant, so believable, so connected with humanity's plight. I'm feeling the itch to go on an adventure. To experience the world in all its splendor and glory. To see and taste the vivid colors of the human family. To unshackle myself from the smallness of duty and commitment. To be liberated of meaningless rules that hold me down. Life is in living; not in NOT doing!